When dividing radicals, the denominator can never be a radical. 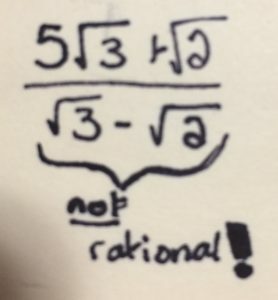 So in order to solve, the denominator must first be made into a rational number. First, use a difference of squares to rationalize the denominator. But since whatever you do to the bottom you must also do to the top, multiply both the numerator and denominator. now add like terms to get a more simplified expression. now you can just simplify the expression as far as you possibly can! 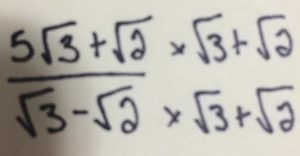 It’s okay for the expression to not equal a single number. This week we learned about geometric sequences and series. A Geometric sequence differs from an arithmetic sequence because instead of adding a common difference, a common ratio is multiplied by the term to get the next term. 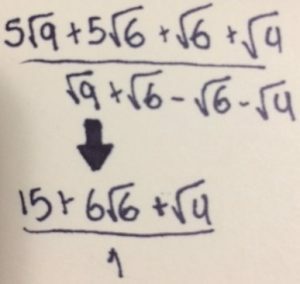 this equation will work for any term within the sequence, as long as the starting term and common difference are constant. If either of these change it is no longer an arithmetic sequence.